Looking for kids friendly dining destination for a group of 18 pax is definitely not an easy task. 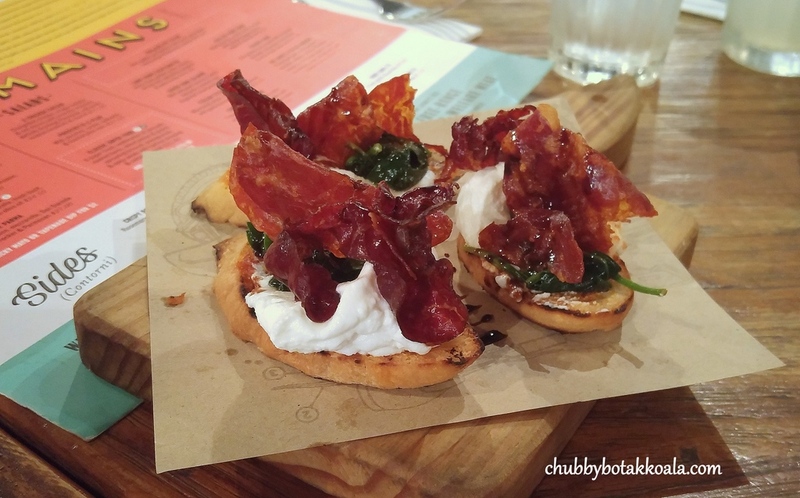 If you do have this dilemma, you definitely must consider Jamie's Italian at Forum. 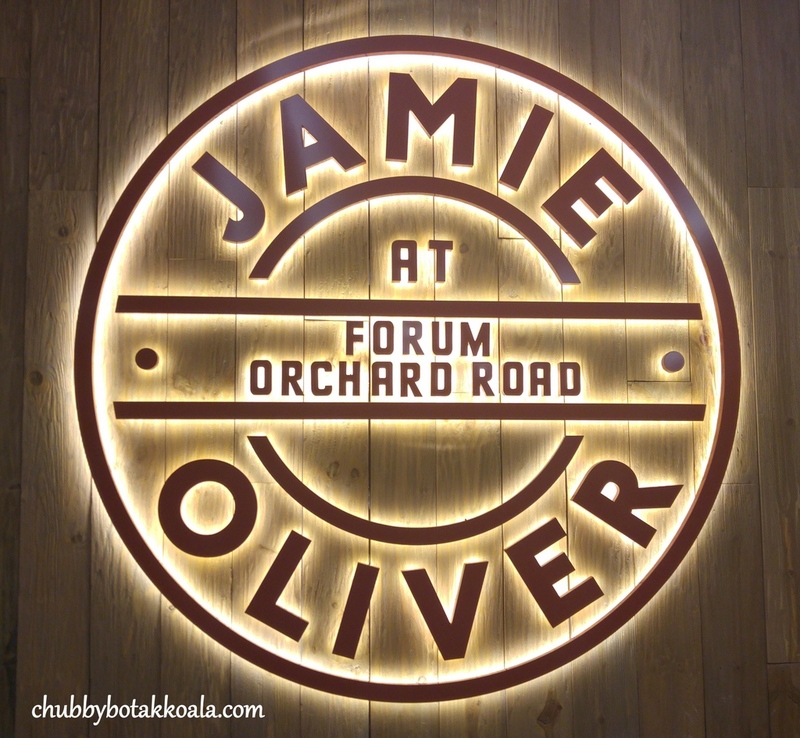 In case you have been living under a rock or somewhere in the jungle of Borneo, Jamie Oliver might sound alien to you. In summary, he is a British Celebrity Chef, author of numerous cook books, plus TV shows, activist who loved Italian Food. Jamie's restaurants always focused on natural and healthy ingredients, with simple cooking method. 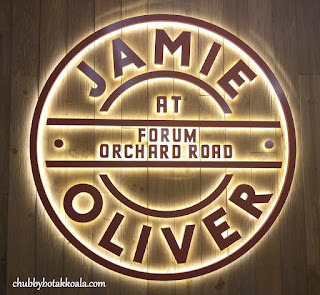 Jamie's Italian at Forum is the second franchise in Singapore. While waiting for the everyone to arrive, LD and I ordered Salumi Crostini ($15). Salumi means different type of salami / Italian cured meat. Crispy bread with buffalo ricotta, crispy salumi and drizzle with balsamic vinegar. Crispy, creamy, sweet, with subtle acidity just make a perfect entrée. A good start to tease the palate. If you are an olive fan, you might want to try their World's Best Olive ($8.50). 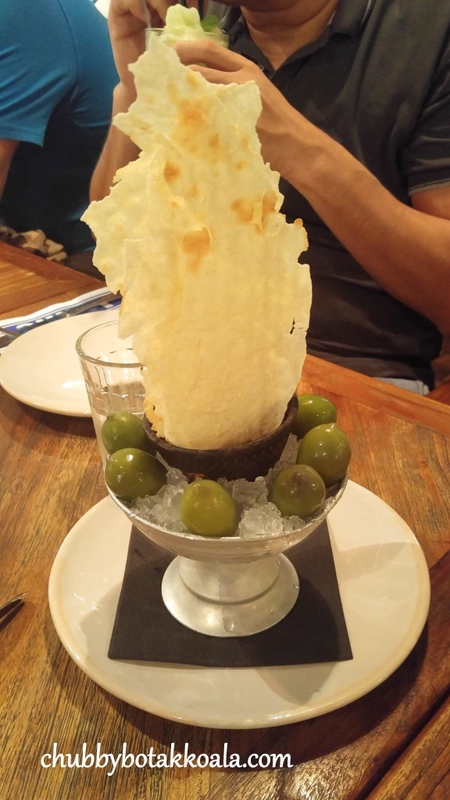 Consist of large green olives, with black olives and sun-dried tomatoes tapenade & crispy music bread. I am definitely not a fan of black olive, but I discover green olive is easy to like. Crunchy, refreshing with a touch of delicate sourness almost like a gherkin. Since we have a big group, we ordered plenty. Prosciutto & Pear Salad ($25.50). 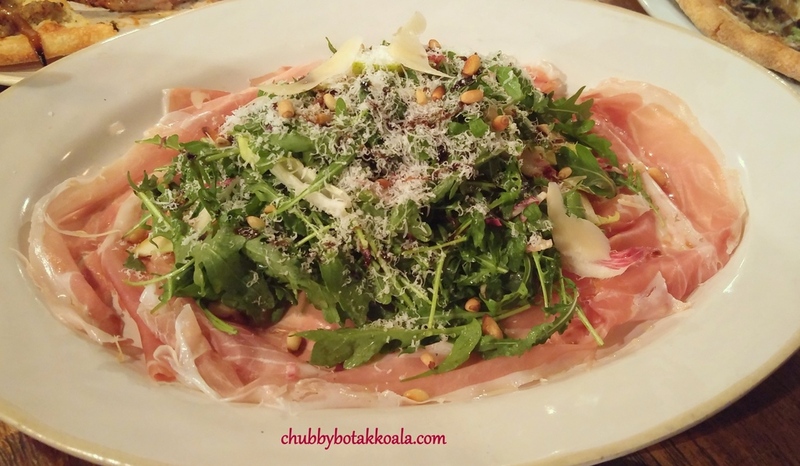 A simple combination of prosciutto and pear, with pecorino, rocket salad, balsamic and toasted pine nuts. It is definitely refreshing, I personally like the combo of salty prosciutto with natural sweetness of the pear. The pecorino, rocket and balsamic just enhanced the flavour in the dish further while the pine nuts give the dish its crunchy texture. Gennaro's Italian Sausage Pizza ($27.50). 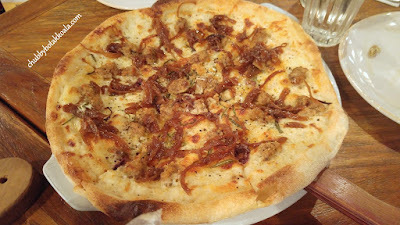 Bianco base (white pizza) with fennel sausage, balsamic onions, black olives and rosemary. Interesting white base pizza, with unique flavour arising from sweet balsamic onions and black olives. The dough is crisp and chewy, like a sour dough. However, I feel it lacked some creaminess from the cheese component. 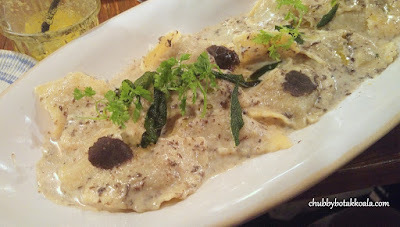 Ravioli Con Carne ($26.50). Beef ragu-stuffed pasta with sage brown butter, crispy pancetta, lemon & parmesan. It is a good dish, with al-dente pasta sheets filled with ragu beef. The sage brown butter gave the dish a rich flavour however, it is missing the OMPH factors. It can do with more sprinkle of salt. 280g Rib-eye Steak ($46) served with grilled portobello mushrooms, gremolata, funky chips and balsamic onions. 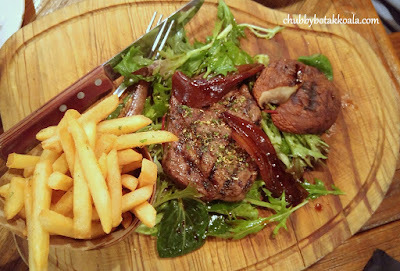 We asked them to cook to medium rare however, we still find the steak slightly chewy, lacked richness and marbling of ribeye steak. Surprisingly, the grilled portobello was the best ingredients to the dish. Definitely, has lots of room for improvement. Lamb Rack ($88). Lamb rack coated with herby breadcrumb served with roasted mixed root vegetables and a yummy red wine sauce. Easily the best dish of the night. Cooked to medium rare, the meat just melts in your mouth. Absent of gamy flavour, the lamb is just to die for. It is not in the main menu, so you must keep a look out on the special board. A must order dish here. Service is friendly, accommodating and professional. 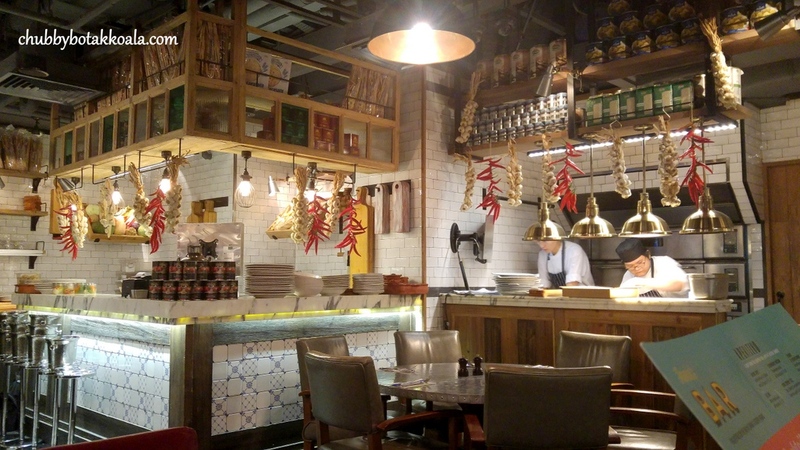 The décor of the restaurant is modern, casual with a combination of open concept. The set-up and service are definitely geared towards child-friendly environment, where you and your family can dine freely. The semi open concepts will allow you to see the chefs preparing your food, maybe pique the interest of the young ones in cooking. Please note that due to Jamie's focus on healthy eating, you might find the kids meal a bit bland. Feel free to add more seasoning to your child likings (cheese, salt or pepper). 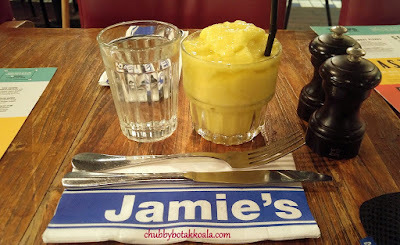 Overall, An evening in Jamie is definitely an interesting experience. It was packed during the dinner service. The food is simple yet delicious, but don't expect a high-end Italian restaurant version. 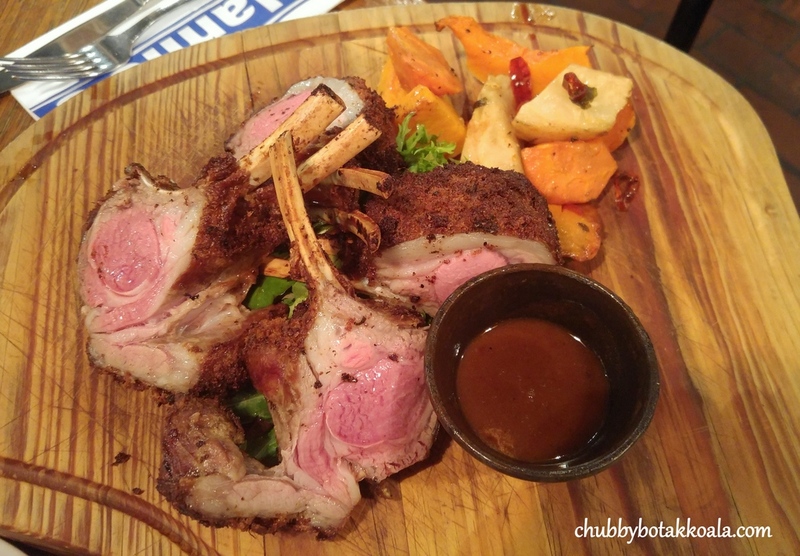 We'll definitely return for the lamb rack. Cheers!! Budget per Person: $26 - $50; $51 - $80.